If you are facing sewage damage in Canton caused by broken pipes, flooding or other causes, you need the services of a professional restoration team in Canton that can handle the sewage with the proper equipment in an expedient manner. Sewage backup is not like other types of flooding and water damage. 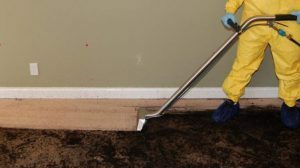 The water used to carry sewage contains toxins that cannot only discolor your home’s interior and leave it with an unpleasant odor but can also cause health concerns. This is not the type of situation that warrants getting out the heavy duty shop vacuum and a few floor fans. Unless the proper precautions are taken to thoroughly clean and treat the affected areas, you could be facing health issues for months caused by the bacteria left behind from the contaminated water.